Impact regions through the development of new programmatic and policy interventions that build on strengths and support weaknesses to support IDEs. Each team that participates in the program must have a representative from each of the 5 stakeholder categories. Each team determines one or more strategic interventions to implement during the 2-year program as well as the metrics to measure impact of that programmatic or policy intervention. Throughout the program there are 4 workshops. A typical workshop is 3 days and consists of lecture & discussion, case study analysis, ecosystem engagement tours, programmatic deep dives, group work report-outs, and preparation for action phases. Three workshops are hosted at MIT and one workshop is hosted by a selected partner region. 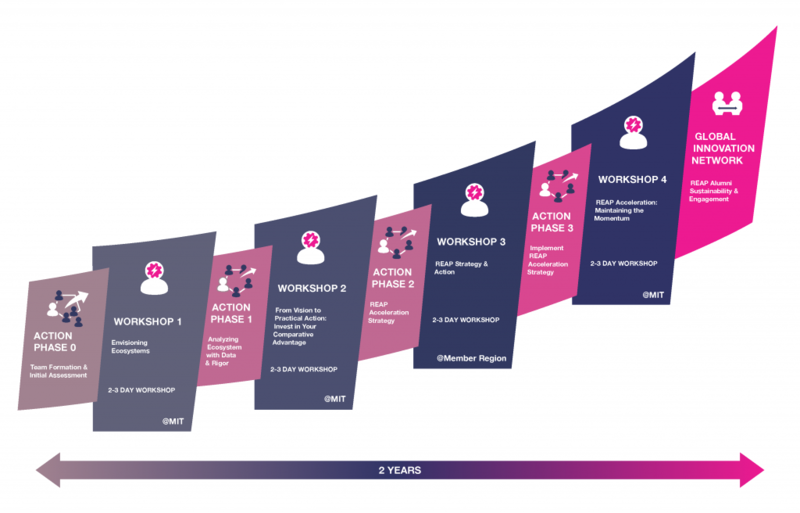 Action phases are active time between workshops where teams return home to deepen analysis, validate assumptions with a broad network, and implement new programs and policies. There are 5 Action Phases over the course of the program. See here for an example program launched. MIT REAP 2-year overview of action-based learning cycles.